The way this is being reported, it sounds as if higher prices are good for the economy. Common sense tells us that lower prices are good for us, but it would hamper the U.S. Treasury and the Federal Reserve from expanding our debt load. …putting pressure on retail sales. (Bloomberg) Sales at U.S. retailers rose less than forecast in July, indicating a lack of jobs is prompting Americans to hold back on spending. The 0.4 percent increase, led by autos and gasoline, followed a revised 0.3 percent drop in June, figures from the Commerce Department in Washington showed today. Economists projected a 0.5 percent gain, according to the median estimate in a Bloomberg News survey. Excluding auto dealers and gasoline stations, purchases fell 0.1 percent. 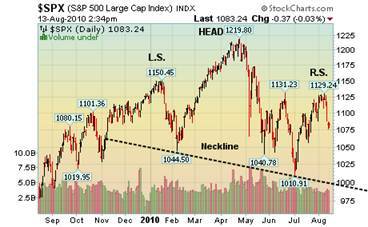 The Economic Cycle Research Institute, a New York-based independent forecasting group, said its Weekly Leading Index rose to 122.4 in the week ended August 6 from 121.7 the previous week. The index's annualized growth rate rose to minus 9.8 percent from minus 10.3 percent a week earlier. That was the highest since July 9, the last time it stood at minus 9.8 percent. Investors are saying “No, thanks” to increased volaitility. --Investment Company Institute reported that domestic equity (stock) funds reported their 14th sequential outflow last week as $2.87 billion was withdrawn from stock mutual funds. Despite the rally in July, mutual fund investors are shunning stocks due to the increased volatility. Even the short sellers are staying away, removing the potential buffers that keep declines in check. There may be big trouble ahead. 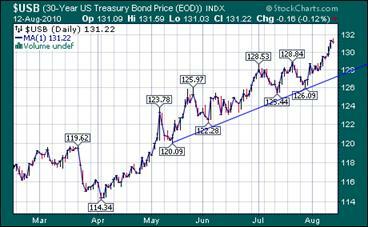 Treasury bonds advance on slowing recovery. -- Treasuries advanced this week as news of the slowing recovery took investors out of risky investments. Yields are now at April 2009 lows, suggesting that a major stumble in the economy and the markets is not far away. Bonds may be a temporary safe haven, but as the leverage unwinds, bonds, which are also leveraged, may have to be sold as liquidity disappears in the stock market. 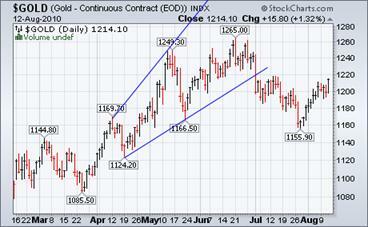 Gold may have finished its bounce. --The rally in gold appears to have decelerated this week. The blame is being put on the dollar rally for the weakness in gold today. From a short-term point of view, that may be valid. However, gold has had quite a run since June, 2001. Nine years is a long time in any bull market. It may need a rest. 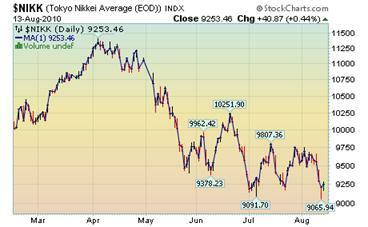 Is the Nikkei in a new bear market? -- Yesterday, the Nikkei 225 fell to a level 20.5 percent lower than an 18-month high set on April 5 in intraday trading. Some analysts consider a 20 percent drop from a recent high as the beginning of a so-called bear market. The gauge later pared declines, closing down 19 percent from the April high. 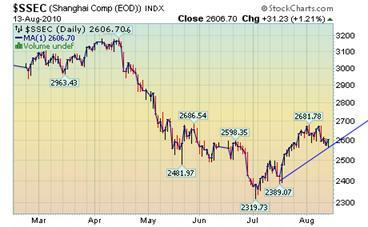 The Shanghai index is still in an uptrend. -- China’s stocks rose, trimming the steepest weekly loss in more than a month, as investors speculated the government won’t further tighten lending and property curbs given the slowdown in the economy. The Shanghai Composite Index, which tracks the bigger of China’s stock exchanges, gained 31.23, or 1.2 percent, to 2,606.70 at the 3 p.m. close. It lost 1.9 percent this week, the most since the five days ended July 2, after reports showed inflation quickened while growth in industrial production and new bank loans trailed economist estimates. 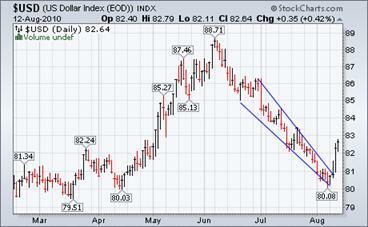 The dollar broke out of its (bullish) wedge. The dollar emerged from a wedge formation that has bullish implications. This form of wedge is called an ending diagonal, which implies not only a complete retracement, but new highs as well. 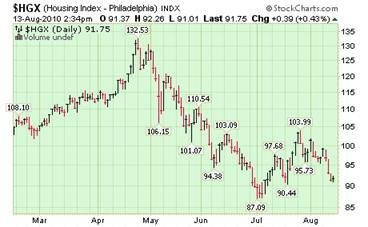 From a cyclical view, the dollar made an important Seasonal low. This kind of low may not be seen again until April, 2011. -- During the great housing boom, homeowners nationwide borrowed a trillion dollars from banks, using the soaring value of their houses as security. Now the money has been spent and struggling borrowers are unable or unwilling to pay it back. The delinquency rate on home equity loans is higher than all other types of consumer loans, including auto loans, boat loans, personal loans and even bank cards like Visa and MasterCard, according to the American Bankers Association. 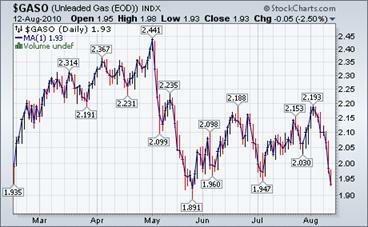 Wholesale gasoline prices decline yet to be seen at the pump. 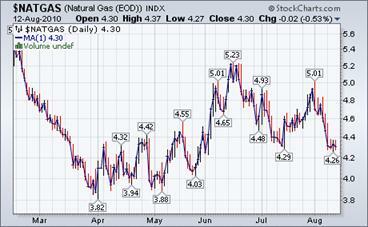 Favorable supply picture trumps hot weather and hurricane season. (Wall Street Journal) Could Wall Street be about to crash again? This week's bone-rattlers may be making you wonder. I don't make predictions. That's a sucker's game. And I'm certainly not doing so now. 5. People still owe way too much money. 9. We're looking at gridlock in Washington. (ZeroHedge) Rick Santelli went a little nuts this morning, in a rant that easily qualifies in his Top 3 of all time. Rick gets wound up based on earlier disclosure by Bill Gross that if the government guarantee of the GSEs were removed, he would only participate in the mortgage market if there was 30% down payments by first time homebuyers (oh, and guess who will be present and providing "eye of the monopolist beholder" advice at next Tuesday's panel). As Rick summarizes: "The people holding, the Treasury or institutions, are locked up in this place where the subsidies can't come out. Extrication is going to be difficult much less getting out of the way of anything they may do in the future." Rosenberg Interview: "If You Don't Believe In A Double Dip, It's Because The First Recession Never Ended"
(ZeroHedge) Sick and tired of CNBC "interviews" in which the speaker is given 15 seconds in between commercials to explain why the economy is in the toilet, before another talking head… appears and starts spouting painfully ridiculous things? So are we. Which is why we refuse to link to David Rosenberg's earlier presence on CNBC, and instead we present Rosie's following 26 minute interview with the WSJ which is a must watch for all who want to listen to exiled Merrill Lynch rep express a coherent realistic thought before some CNBC associate producer screams "cut to commercial for incontinence pills." And, true to form, Rosie starts off in style: "If you don't believe there's going to be a double dip, it's because the first recession never ended. If there is going to be a double dip, the odds are certainly higher than 50-50." Traders alert: The Practical Investor is currently offering the daily Inner Circle Newsletter to new subscribers. Contact us at tpi@thepracticalinvestor.com for a free sample newsletter and subscription information. If you are a client or wish to become one, please make an appointment to discuss our investment strategies by calling Connie or Tony at (517) 699-1554, ext 10 or 11. Or e-mail us at tpi@thepracticalinvestor.com .